Introduction: Duncan Kuehn is a professional genealogist with over eight years of client experience. She has worked on several well-known projects, such as “Who Do You Think You Are?” and researching President Barack Obama’s ancestry. In this guest blog post, Duncan provides 10 tips to help find your living relatives and record family history information from them—complementing the genealogy work you’re doing on your long-ago ancestors. There are many different reasons to search for your living relatives. Some of these include organizing a family reunion, finding out-of-contact relatives, or locating family heirlooms, keepsakes, and photos. Doing this sort of research may seem challenging, but the 10 steps explained below will help you in your quest to find living family members. 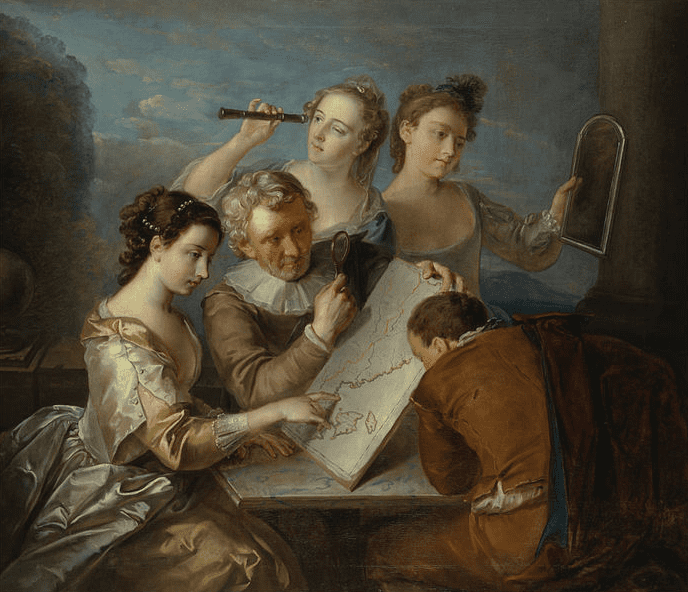 Painting: “The Sense of Sight” by Philip Mercier, 1744-1747. Credit: Wikimedia Commons. Genealogists like to collect the low-hanging fruit first. Start with yourself. Record what you know about your family history and what clues you might have. Determine exactly what you want to discover and outline a plan of action. Record all the information you find in one location. If you had to guess, who do you think might have it now? Was anyone interested in family history? Who handled the estate of the person who last had it? Even if they can only say that one of great grandpa’s daughters had an interest in family history, but they don’t remember the name, it is a clue that you should record. If you were able to find and speak with your parents and all your siblings, move back to your grandparents and find all their children and grandchildren. Again, your immediate family can assist you here. They may know that Cousin Jane lived in Milwaukee and Uncle Joe went to Texas. Reconstruct the family tree the best you can from all their hints. You will probably get some conflicting information; don’t worry about that now. But don’t disregard any conflicting information, even if you know it is wrong. You may find that the story about Aunt Sara never happened to her, but it did happen to Aunt Beth. While asking for stories and information from and about your extended family, also ask for a copy of any documents or pictures that they may have. Make copies; don’t take their original documents. Be sure to keep track of where each family document came from. You will want to know where the information came from as you move further into your research. You can also start collecting documentation from various family history websites, libraries and archives. Show these documents to other family members to see if they can help jog their memories. So far the process we have followed has been similar to doing regular family history on long-gone ancestors. The following steps will diverge from that familiar path, as you research your living relatives. You can use all the traditional genealogy sources as you move forward in time, rather than backward. However, there are also some resources you may not have thought of—like yearbooks, voter lists, association memberships, old city directories, and so forth. My four favorite resources are: obituaries, Facebook, Google, and online directories. These will be discussed in more detail below. Begin charting out the family structures in a descendancy chart. Mark family lines that die out, those you have found, and those that need more work. Unlike going backward where each generation only adds two people, going forward one generation can dramatically increase the number of people you are looking for. Illustration: descendancy chart. Credit: GenealogyBank. Once you move back one generation, follow all the descendants forward in time until today. If your grandparents were having children before 1940, you can search for the family in the U.S. Federal Census to gather the names and ages of the children. If you have access to the birth certificates you can also look through the index to find your grandparents listed as parents. Newspaper databases like GenealogyBank’s Historical Newspaper Archives have birth announcements as well. Keep in mind that not all birth announcements will mention the new baby’s name, so search for these notices using the father’s name, the date range, and a keyword like “birth” or “San Antonio” (or the city they were living in). Finding the death information for each generation is also helpful. Look for everyone’s obituary. Sometimes finding your aunt’s obituary can help you find your grandparents. You can use the Social Security Death Index (SSDI) on GenealogyBank’s website to quickly discover the date of death to help you in your search for obituaries. However if the person died within the last three years, the SSDI no longer has that death information available, and you will have to begin by searching directly for the obituary. Obituaries are priceless documents as you move forward in time tracing your family tree. The obituary will often list the deceased’s children and grandchildren by name. In addition to their name, it will often mention their location. This is crucial information to help you locate their current contact information. Obituaries are some of the most valuable records you can find in your search. Other newspaper articles can be helpful in finding your living family members as well. They can give you information on the person’s location, family members, and other biographical information that can help you confirm that you have the correct person. It always amazes me what people post on Facebook! There are all sorts of relationships, locations, and birth information on Facebook users’ profiles. Some statistics say that one half of the world’s population uses Facebook. It is a wonderful resource for genealogy research. If an individual’s profile is public, you can also view their list of friends. To find possible relatives, just type in the last name on their “friends” page. This can help you confirm that you have the right person and also help you find the other family members you are searching for. Google and other search engines are also important family-finding tools. Try Googling your own name. You may be surprised at what you can find out about yourself online! For example, a quick search for my name brings back my LinkedIn page, professional website, GenealogyBank blogs, my BYUi faculty profile, my RateMyProfessors page, my twitter account, and of course my Facebook page—as well as several images of me. I am a fairly private person, but there is plenty of information about me out there in cyberspace. If you are looking for living people, you will have a lot of information to search through. 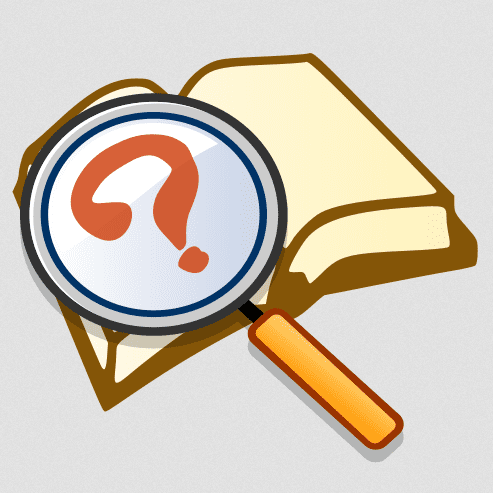 There are several books that can teach you how to use Google in the most effective way for investigative purposes. One of my favorites is Google Toolbox. Illustration: magnifying glass. Credit: Equazcion; Wikimedia Commons. When Googling the name of the person you are looking for, you will probably run into several directory pages as well. Some popular directory examples: WhitePages.com, Intelius.com, and PeopleFinder.com. These are great tools to use to locate family members, but they can be a bit tricky to make sure you have the right person. Use three or more items of information to confirm the correct name. For example, when searching for someone on Intelius.com, a list of names associated with that individual and a list of previous residents will appear. If you know from grandpa’s obituary that the person you’re searching for lived in San Antonio and was the son of Jacob—and you find a person with a previous address in San Antonio, an associate named Jacob, who is of the correct age—you may very well have the right person. In today’s world, it is easier to find someone’s Facebook account, email address, and physical address than it is to find their phone number—although that is still possible. You will often find one person by searching for others. Make sure to keep track of all the information you gather, even if it doesn’t seem relevant at the time. These are a few tips to get you started in your hunt for living relatives on your family tree. To learn more you can visit the Council for the Advancement of Forensic Genealogy (CAFG) and read their past newsletters for additional tips and tricks to find family members. Keep in mind that once you locate the relatives you are looking for, you need to be respectful and careful about contacting them. You were searching for them, but they may not know who you are and may be suspicious of what you want. A short friendly message of introduction and an offer to communicate further is helpful. You have done a lot of detective work to find them and may feel a strong familial connection with them, even though you have not yet met. They may not feel the same. Your message may arrive out of the blue and completely catch them off guard. Keep this in mind as you make an effort to connect with them. Best of luck in your family search! 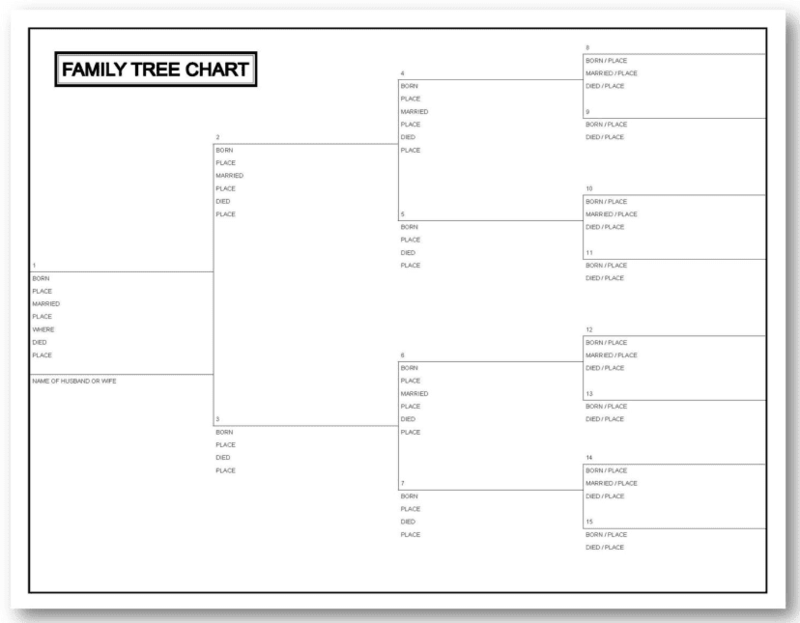 That’s a pedigree chart, not a descendancy chart (except for one line, of course).